Partial view of waterside deck accessed from great room. And did we mention the sunsets? The Sidney BC ferry on its way from Friday Harbor. An abundance of boating traffic also. Water-side dining room where meals can be shared without losing sight of what's going on. The kitchen is bright, cheerful and serves your visit well. One of two upstairs loft areas, not fully enclosed. Downstairs sleeping area off the great room. Spring Escapes Special! 10% discount for stays during 3.1.2019-4.28.2019. 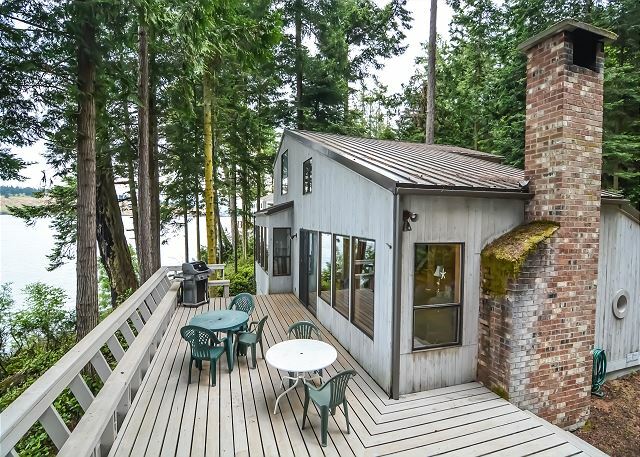 This classic waterfront vacation cabin on San Juan Island reminds many visitors of blissful childhood vacations, when things were not expected to be fussy or complicated. Our guests who have stayed in this home return year after year to enjoy the laid back atmosphere and island lifestyle (one even puts up his own mailbox)! Sunset Vista is a great choice for a couple or family seeking a casual island getaway. 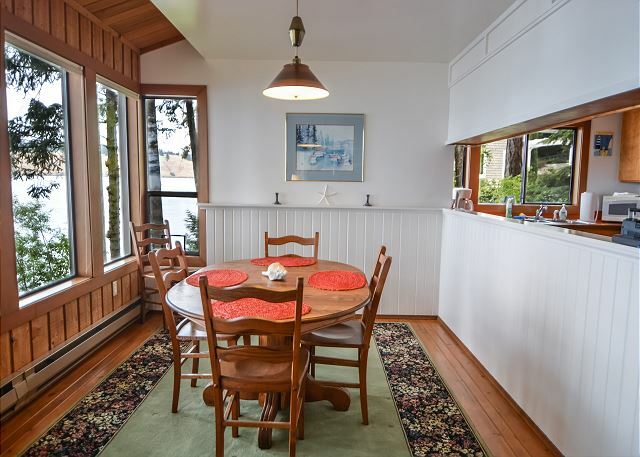 The home is located down a wooded driveway on a quiet neighborhood street in the desirable Roche Harbor area. The neighboring streets are great for biking and walking while the dining, shopping, and marina activities at Roche Harbor are within a 5 minute drive or easy 20 minute walk. 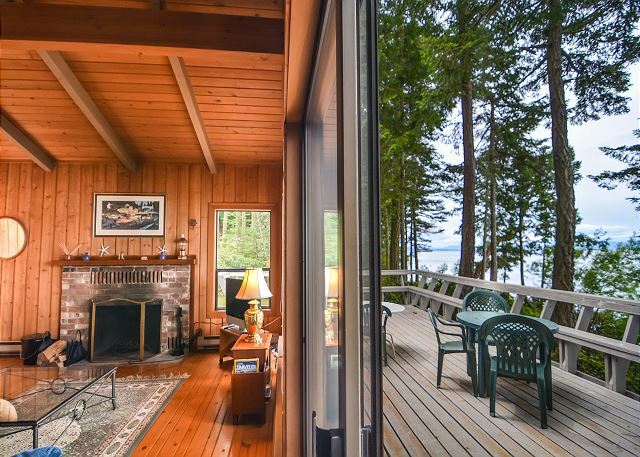 From the deck there are marvelous views of Spieden Island and you will also have a front row observation post to watch the boating activity heading to and from Roche Harbor and Sydney, BC. On long summer evenings you are positioned to catch those spectacular sunsets over the western sky. On the main floor, there is a bath with a shower as well as a private bedroom with a queen bed. 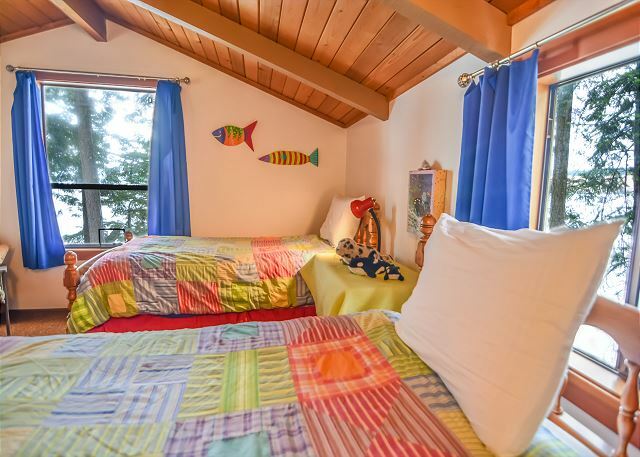 Other beds are located on an open loft upstairs. This area provides two separate sleeping areas divided by a wall, one with two twin beds and the other with a full size bed. Please note that the open loft does not provide total privacy for either of the upstairs sleeping areas. The living room features a wood burning fireplace (wood not supplied) and a built-in daybed. Sunset Vista is on medium bank waterfront with no direct shoreline access, however it is only a two minute walk to the beautiful neighborhood beach known as The Isthmus. The neighbor may be finishing building his home next door, and has been cooperative and workable with minimizing any excessive noise. Say hello to the seals! We loved this view location, where we were visited by curious seals and could watch porpoises swimming by. The home was very comfortable and suited our needs well. We loved staying at this rental home. While it was outdated and had a rustic feel/smell, the location on the ocean and near Roche Harbor was amazing. We spent every morning and evening watching the wildlife in the ocean. Purpoises, seals and even Orcas. We saw two Orcas that felt so close we could almost reach out and touch them. We were also visited by a deer family every evening. The kids enjoyed every minute and loved playing the board games especially uno spin, at the rental. Never even turned on the TV. Note that there is a section of the cliffside that juts in and needs fo be marked better to prevent someone from accidentally falling. Very relaxing, the BEST views! We arrived late at night and could tell the view was incredible. What a lovely surprise the next day! We loved watching the boat and seaplane traffic, and the sunsets were mesmerizing. Our son loved tucking away in the built-in bed and our girls each took a twin in the loft. The main bedroom is the only one with a door, so be aware if you have light sleepers (we just used white noise app on our device). The kids were happy to find a few toys and puzzles and great selection of games. We never even turned on the TV given all the other things to see and do. 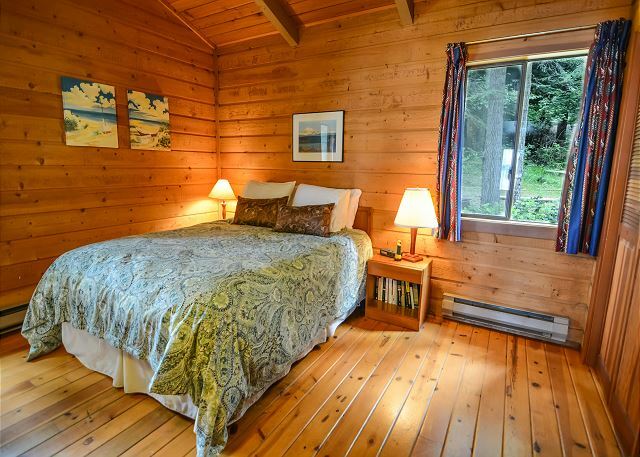 The home is a sweet family cabin. The kitchen and bath are dated but all very clean and functional. Beds, small washer/dryer and brand new grill were great. Did I mention the view??? GREAT location. Great location with gorgeous views! House and appliances are dated however the property is immaculate. Plenty of towels and comfy bedding. Away from it all but not too long of a drive into town and beaches. My parents, 2 young boys, and I stayed in Roche Harbor as little reunion. We were delighted with our stay! 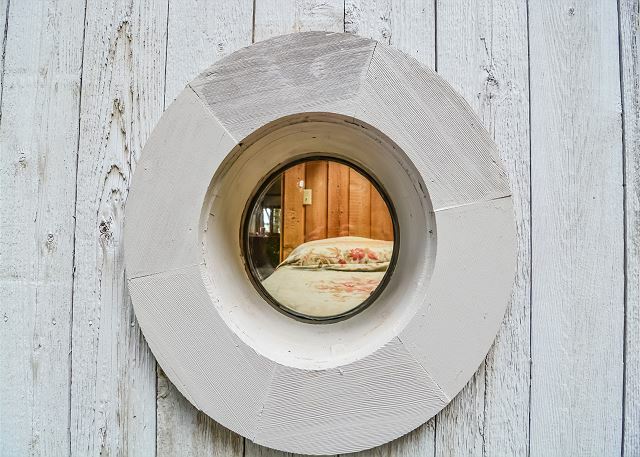 The boys loved the little nook with the skylight and porthole, and the adults practically lived out on the deck with coffee in the morning and wine in the evening. The home was well cared for and well appointed. We had seals, porpoises, and a variety of birds visit daily. Roche Harbor itself is, of course, a gem with a fantastic little market. We hope to come back every year, next time with husband in tow! Windermere communicated well and was readily responsive to our pre-trip questions. 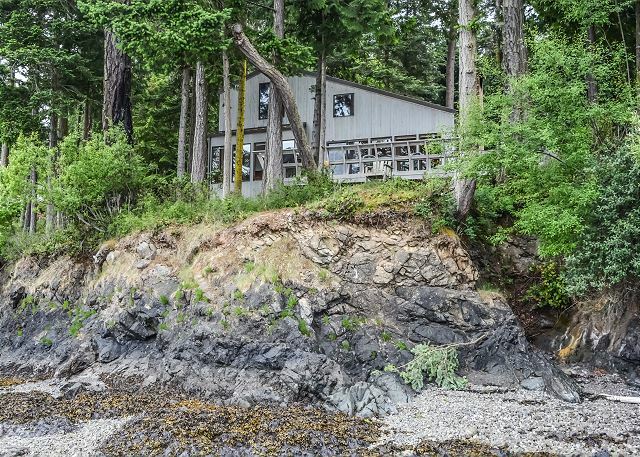 Unit located in a pleasant secluded spot on the shore, about 1.2 miles from Roche Harbor and near a boating route frequented by pleasure craft. Unit spacious and well suppled. Overall, we were pleased. However, to our disappointment, unit was significantly older than its photos indicated, which appear to have been digitally enhanced. Although clean and fully serviceable, unit likely dates from the 60s or 70s and could use a refurbishing, including replacement of furniture and fixtures. Don, Thank you for your generally complimentary review. We are concerned that you felt Sunset Vista did not live up to your expectation. We strive for 100% guest satisfaction continuously and are disappointed when that has not been the case. As you will see from the many posted reviews of this home, it normally receives very complimentary reviews. To address a couple of the items you mentioned, this home was built in 1977, but has only been rented for the last ten or so years and has been continuously upgraded as maintenance was needed. We'd like to provide just a few examples such as the bathroom, which was updated several years ago, exterior paint was done about five years ago, the television is new two years ago, and bedroom décor was redone within the last couple of years. We do not digitally enhance any photography and in this case hired a professional photographer to prepare detailed high-resolution photographs so our guests can accurately evaluate this home before they rent it. Finally, I would point out that as you mentioned, Sunset Vista offers an excellent location with an interesting waterfront view of passing ferries and boats galore. It is also very reasonably priced for the number of folks accommodated. We do, however, apologize that you were even a bit disappointed with Sunset Vista. Location was great. The views incredible. We definitely would stay again. Thanks for allowing us to stay in your home! We could not have chosen a better place to stay for my wife and I along with our 22 month old daughter and 10 year old niece. The house was everything we could have asked for and more. Pictures sometimes give a distorted view, but with this place pictures can't even do it justice. It was very comfortable and clean, had all the amenities one needs (a great grill!) and above all else...that view. We spent most of our time on the deck and in the yard. There was plenty of space for the kids to play and plenty of deck for mom and dad to relax and have a drink. Words can't express how amazing the view is here, especially the sunsets. They don't call it Sunset Vista for nothing. On top of all that, we saw harbor seals, deer (nearly walked right up to us), a red fox, a bald eagle ORCA. One lone orca swam past the house our second to last night! It was the highlight of our trip even though we had already seen pods from a boat, Lime Kiln and San Juan Park. To see one come right by while you're having a drink on the deck was magical. The check in/out procedure was also a breeze. We would love to come back. If we lived closer I think we'd make this house an annual trip if not more often. Let me know if it ever goes on the market! 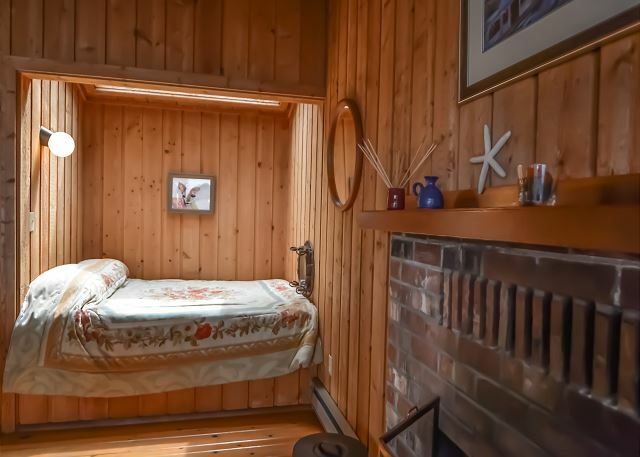 The home has a wonderful get-away cottage feel. 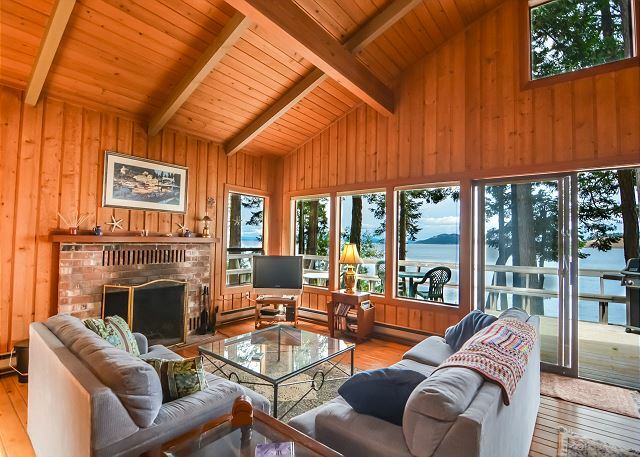 The views from the living area and dining room of the ocean and islands of Davison Head are breathtaking. The deck also overlooks this spectacular view. We had seals visit us daily as well as many birds and deer. The neighborhood is lovely and quiet. 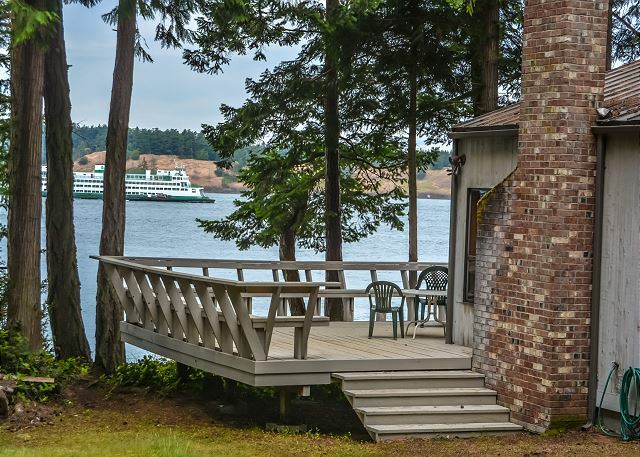 You are close to the charming Roche Harbor where you can access activities, enjoy the beautiful gardens or have a delicious meal and cocktails at McMillans or Madrona. I have nothing but good things to say about this rental home and the location. It was simply perfect. Myself and a couple of girlfriends stayed in this adorable cabin for a weekend on the island, and loved every minute! It's tucked away from the hustle and bustle, but still easy to get to. Nothing too fancy, but had all the necessities we wanted, and stunning views! We walked to Roche Harbor one morning, not bad at all. We spent a lot of our time out on the patio watching wildlife and the stunning sunsets! We spotted so many sea lions we lost count, had a few visits from deer, harbor porpoise, and enjoyed the sounds of all the beautiful birds! The house was clean and well kept. We would definitely recommend to others this cabin, and if we're ever in the area again, would love to stay again! Surrounded by wildlife, black tailed deer, pesky raccoons, a sea otter eating it's catch on a rock just below the bluff. We named the many seals for their distinct characteristics, as they visited daily, easily seen from deck and cabin. Watching the ships, ferries and various boats was enjoyable and the sunsets were fabulous. The location was great with enjoyable walks to the isthmus and great times exploring nearby sculpture garden, mausoleum, San Juan County Park and Lime Kiln Park. Our only complaints would be uncomfortable deck and living room furniture, noisy construction work on each side of the cabin and a confusing thermostat that turned the heat way down every few hours. The staff was extremely friendly and helpful. The location was beautiful, the back deck view is gorgeous. We saw whales and seals! The rooms and beds were comfortable. The water pressure in the shower is wonderful. The internet, while a bit slow on the island, was good enough for us to do our work in the evenings. The only thing that didn't work was the dvd player, but that's an easy fix. If we ever work near Roche Harbor again, we'll be checking the availability of this place. The quiet location is outstanding: we greatly enjoyed watching the boats go by and the sunsets were outstanding. The kitchen was well-stocked and the gas grill is new. Overall, the place is modest and a bit outdated, but was adequate for our stay. Heads up to people who might need to use their laptop: the wifi is extremely slow, so we had to use our cell phones as a personal hotspot. Overall we enjoyed our stay very much! Also good to know: they sell fresh seafood out on the dock at Roche Harbor; you have to walk out there a bit to find it. Wished we knew it when we were shopping, but got some at the dock in Friday Harbor that was delicious! Great location with spectacular views and grounds. Interior is comfortable, well-equipped, and clean. Would absolutely return to Sunset Vista "villa" in the future. We thoroughly enjoyed the home and the quiet and beauty of this side of the island. The cabin has a lovely view. The living room was comfortable for the six of us and the kitchen has plenty of room for group cooking. Having cooked in many vacation rentals, I appreciated the small food processor and blender. The negatives were minor: dishes and silver were not necessarily clean. We easily dealt with it and it's off-putting. The kitchen was remarkably disorganized—-also fixable. The deck table needs a sixth chair. I mention these in the hope that management can take care of this for the next occupants. I would come back and recommend the cabin to friends. Everything from the location to the comfort of the beds at our accommodations were wonderful! 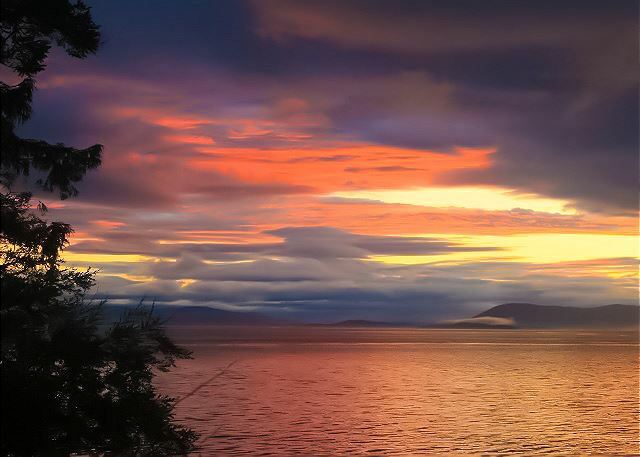 And I can't say enough about the view from our deck and the spectacular sunsets. The reason for our trip was to celebrate one of our traveler's 75th birthday and she said it was the best vacation she has ever had. We did not have a need for any interaction with owner or manager due to having everything we need and no issues during our stay which is always a plus. We visited the towns some but mostly relaxed, some of us took long walks, while others just relaxed out on the deck and enjoyed the beautiful view and activities going by. I would highly recommend this property to others and hope to return. We found the location to be perfect for our trip. The house with a large deck is set on the north end of the Island on the water facing north over the San Juan channel toward Speiden Island. The north end and west side of the Island is by far the most scenic and interesting in our view. The north orientation still allows for very nice summer sunsets coming in over the left side of the deck without being too hot. This is actually preferable to a direct westly orientation in our view. (Winter sunsets would be less visible). Watching the water traffic on the sound - kayaks, sailboats and the Vancouver Island ferries - is a great past time. The house is spacious for two couples - one in the closed bedroom downstairs and one in the open loft above the living room. There is plenty of privacy. Three couples would be too crowded in our opinion. 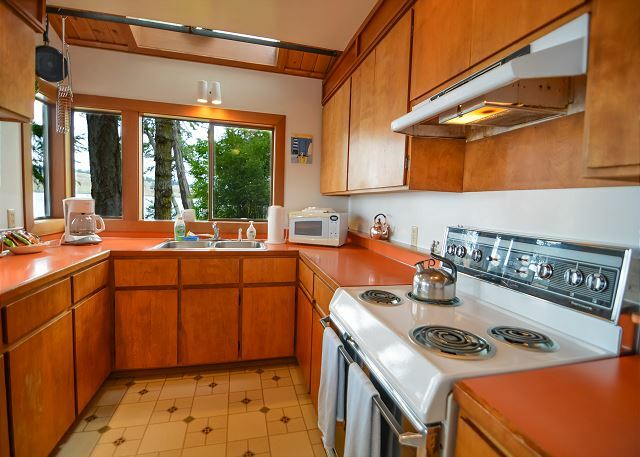 The kitchen is adequately provisioned with cookware and dishes and appliances. The interior furniture is very nice and comfortable. There is one bathroom on the main floor. The lovely spacious deck could benefit from some nicer deck furniture since a lot of time is spent out there. The propane barbeque appears to be relatively new and works well. The house is a short bike ride to Roche Harbor - a very picturesque marine village on a lovely harbor. Other than being in the house or in a harbor town, access to the ocean front on San Juan Island is limited as its mostly privately owned with lots of no trespassing signs. This was somewhat frustrating for our explorations as the north side of the Island has so many little bays and inlets that are inviting. Renting a small boat in Roche Harbor to explore would be the solution to this. There are some lovely federal, state and county ocean front parks to visit, however. And plenty of hiking trials in the interior including some spectacular high point vistas above the English Camp federal park. All in all, we had a wonderful time. Amazing expereince for teen cousins! great place to stay with teenagers. so close to Roche and they could bike and kyak there on their own for donuts! View was absolutely beautiful and serene. The reality of truly beautiful sunsets met the home's Sunset Vista's name fully. The time spent on the seaside deck was the best part of the vacation. The wide open home design with windows completely across the back opened up to bring the outdoors into the house, sunny or cloudy weather. Our multi-aged family enjoyed the experience. We had never vacationed in the San Juan's before and really knew nothing about where to stay. We absolutely loved our rental home and by day two realized how lucky we had gotten on location. Though the home was modest, it met our every need and we truly loved our view and the beautiful drive to and from the cabin's location at the end of a lane. We were removed enough to absolutely enjoy the quiet yet close enough to all the islands have to offer in the way of lively activity. We would definitely stay there again. So very charming! Our stay was a wonderful experience. The location across from Spieden Island was both remote from the hubbub of tourist activity and a good viewing location for lots of boat traffic and wildlife (harbor seal, dolphins, fish jumping, immature bald eagle perched outside the window) to see from the deck or dining table. The home was comfortable and in good condition with the exception of a couple of drawers and one door. As is typical of vacation rentals one has to get used to where things are and, in our case, buy measuring spoons. The BBQ worked (had to be started using matches) but was tricky to regulate. Wifi worked at dialup speed so we were able to send pictures to the kids' father it just took a long time. My daughter reminded me that we were there to get away from technology. Not having access to the waters edge was a small disappointment but a short walk to the Davison Head isthmus provided a good shore experience. I should close by saying that the sunsets were gorgeous each night. Jon and Cathy R from Coronado, CA does not recommend this vacation rental. Location is incredible, breathtaking view. Sitting outside in the evening to watch the seal activity was wonderful. Great location for running, plenty of shady roads with terrific views. Pantry nicely stocked with essentials for cooking. We hope to return. Simple but charming cabin with killer sunset view and visits from passing Orcas, porpoises, golden eagles. This was our first time to the islands. We feel we were lucky in staying where we did. We had the opportunity to tour some other harbors on our boat and while all were beautiful, we felt Roche Harbor was the brightest gem of all. We loved the view from our vacation home and it was in a very soothing location - in a woodsy neighborhood. It was just right for our family of five! we will be renting for 3 weeks in next 2-3 years then ask for 30 nights each year after that . we have given your website to pals. This is the sixth time we have stayed at this property and have always enjoyed our time there. It is within walking distance to Roche Harbor which makes a nice hike in the mornings for a reward of Starbucks coffee and scones. It is very relaxing to sit on the deck and watch the boat traffic pass by as well as watching the resident eagles and deer the come through the yard. The description of the house states that it sleeps six. 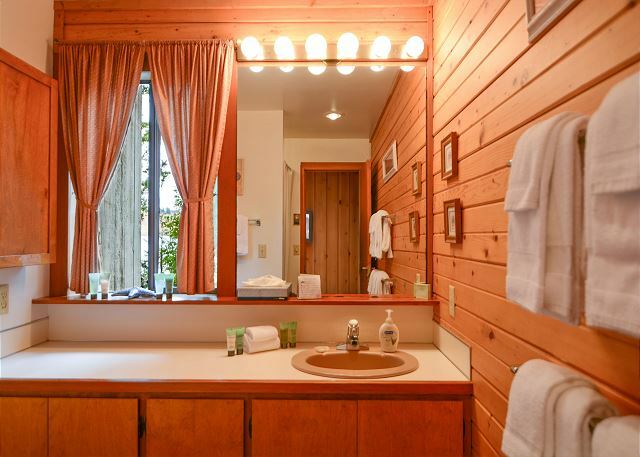 This may be so but there is only one small bathroom, so that may be difficult for six people. Thanks to the website description and previous reviewers, the house was just what we expected and very much enjoyed it. We even brought our own bbq grill! Here are our pros and cons: PROS-- excellent views (of boats, sunsets, harbor seals, and tides), large deck, overall quiet location. CONS-- the coffeemaker worked some times but not all the time, rusty can opener, “stuff” on counter near microwave we think from a critter above, ants here and there in the bathroom, and closet upstairs blocked by bed not easy to use. Minor stuff really but still mentionable. Nice place. We plan to go back, and I'd definitely recommend to our friends. Watch the boats go by! Great place - loved the living room double bed sleeping under the stars. Kitchen well stocked with all sorts of pots & pans. We had a very relaxing week with friends and family. This was our fifth visit to this property and enjoyable as usual. 1. Guests need to be aware that the refridgerator door doesn't close all the way by itself and needs to be forced closed to avoid wasting electricity. 2. A shower caddy would be helpful as there is not much space to place shampoo etc. My husband and I looked forward to this vacation for 6 months and it did not disappoint? We had a wonderful relaxing time and hated to have to leave. We would be happy to stay here again. Thank you to the oweners for sharing their home with us. The only complaint I have is that the outside gas grill was not good at all. It heated unevenly and didn't get very hot. Otherwise, I totally love this place and have been coming for years. Furnishings are a bit dated, but everything is clean and in good condition and the place has everything you would need. Spent three nights here at Christmas with a group of six and everybody had enough room to move about comfortably. The only feature that's not completely obvious from the pictures is that there's only one bedroom with complete privacy; the other two are in an open loft separated by a partial wall; wasn't a problem for my group, but something to keep in mind. Large deck is on a small bluff elevated just steps from the water. Lot is secluded and heavily wooded. I'd stay here again. Very good value. Only drawback for our stay was that the TV was on the fritz; so much for the Christmas movies! This place has an unbeleivable sunset view, we never grew tired of it. The place itself is a nice cabin but has all the essentials. Nice distance to Roche Harbor - we enjoyed the bike ride. Would definately recommend to a freind. I love the place. It has a very cozy feel to it and the sunsets cooperated very nicely. When we complained to Windemere about noisy neighbors, majically they quieted down. Windemere also got the washer hot and cold lines reversed to where they belonged.